Long time ago, there lived a jackal in a forest. One day to get some food, the jackal went into a nearby village. Seeing the jackal, the dogs in the village started barking and chasing the jackal. To escape from the chasing dogs, the jackal ran into a near by house. That house belonged to a dyer. The jackal accidentally fell inside a bucket which had blue dye. The jackal was stained with blue color all over. The jackal then returned to the forest with a sad face. But in the forest all the other animals were surprised at the appearance of the blue jackal. The jackal wanted to take advantage of the fear he found in the faces of other animals. So he told them a lie that he was sent by the Lord from the heaven to rule the forest. 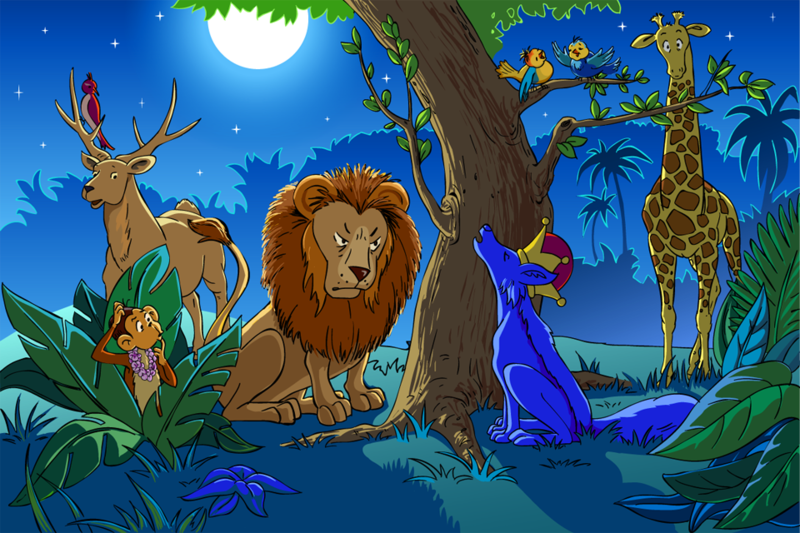 All the animals believed his words and made him the king of that forest. The jackal made lion as the minister, the tiger was appointed as his security guard. The Elephant was appointed as a servant. 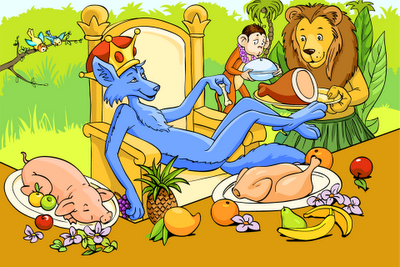 All other animals were also ordered to serve the new king, the Blue Jackal. The blue jackal started living a very luxurious life because of his lie. One day, when the blue jackal was surrounded by all animals, an herd of jackals were passing through that forest. The herd of jackals were howling as they crossed that place. Unable to control his natural character, the blue jackal also howled at the top of his voice. Hearing the howling of a jackal, all the animals realized that it was a jackal and they have been fooled by him. They became very angry at him. They hit him and chased him away from the forest. Moral: Truth will always come out.